When you were seventeen and you bought your first car (a brown Mini in my case) it probably cost a few hundred quid and was basically all you could afford. All the really classic cars were way out of of your league, trouble is that 5, 10, 20 years down the line all those classics cost even more now than they did then! Thankfully, the same is NOT true of computers. When I got my first home computer (a ZX Spectrum) it cost my parents about £175, but at the time the machine to have would have been the new Apple Macintosh, but at $2,500 it was a little more than my folks would spend on a twelve year old for Christmas. Today you can pick them for next to nothing. What this means is that a collection of some of the most influential computers ever built is achievable even on a modest budget. The Ziontech Collection of Significance. aka… the shelves with all the old stuff. I will kick of the collection with my own addition. This is my first ever computer, given to me for Christmas in 1982. 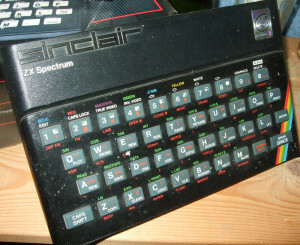 The Spectrum or Speccie, as it came to be known, was the third really successful machine from Sinclair, the others being the ZX80 and ZX81. The Spectrum was among the first mainstream home computers in the UK, similar in significance to the Commodore 64 in the USA. The introduction of the ZX Spectrum led to a boom in companies producing software and hardware for the machine, the effects of which are still seen today; some credit it as the machine which launched the UK IT industry. Licensing deals and clones followed, and earned Clive Sinclair a knighthood for “services to British industry”. As you can see the example we have is a little “beat up” but it’s to be expected considering its age and history, and yes, the Pentium badge was a later addition. I spent many a happy hour playing games such as Manic Miner, Ant Attack and Jet Set Willy on this very machine… Oh, and yes, it still works! The iconic classic that really put Sinclair on the home computing map. The machine’s distinctive appearance was the work of industrial designer Rick Dickinson. Video output was to a television set, and saving and loading programs was via an ordinary home audio tape recorder to audio cassette. It uses a membrane keyboard which really could be a pain. This example is in excellent condition with original box, the infamous 16k Ram Pack and (as you can see in the picture) the quite brilliant, yet bizarre, spark printer. What can you say about this amazing machine? This is one of the only computers that survives even until today. The “Mac” has gone through many changes over the years but this is the first of them. It was the first commercially successful personal computer to feature a mouse and a graphical user interface. The Macintosh project started in the late 1970s with Jef Raskin, an Apple employee, who envisioned an easy-to-use, low-cost computer for the average consumer. He wanted to name the computer after his favourite type of apple, the McIntosh. The design caught the attention of Steve Jobs, co-founder of Apple. Realizing that the Macintosh was more marketable than the Apple Lisa, he began to focus his attention on the project. This example is one of the last of the original M0001 models. The serial number indicates it was manufactured in California in the first week of September 1984. Only a few days later, on the 10th September this model was superseded by the Macintosh 128k and Macintosh 512k. The eMate 300 was a PDA (of sorts) manufactured and sold by Apple Computer to the education market as a low-cost laptop running the Newton operating system. It had a backlit greyscale screen, a stylus pen and a full size keyboard. The green-coloured translucent design by Jonathan Ive (designer of the ipod, iphone, iMac, Macbook etc) eventually influenced the first “clamshell” iBook series of laptops. This example is in mint condition and comes in its original packaging “as new”. The MessagePad was the first series of PDA devices developed by Apple for the Newton platform in 1993. Some electronic engineering and the manufacture of Apple’s MessagePad devices was done in Japan by the Sharp Corporation. The devices were based on the ARM 610 RISC processor and all featured handwriting recognition software and were developed and marketed by Apple. The devices ran the Newton OS. The Apple II was one of the first highly successful mass produced computers. The Apple II became one of the most recognizable and successful computers during the 1980s. It was aggressively marketed through volume discounts and manufacturing arrangements to educational institutions which resulted in it being the first computer in widespread use in American secondary schools. The Apple II Europlus, included the Applesoft BASIC programming language in ROM. This Microsoft-authored dialect of BASIC, which was previously available only as an upgrade, supported floating-point arithmetic, and became the standard BASIC dialect on the Apple II series. When we got this one I couldn't help but do a little nostalgic "Peek'n & Poke'n" but the site of a computer from 1978 hooked up to a 1080p 42" widescreen was a little weird! The Atari Portfolio – the world’s first handheld/palmtop/pocket “PC” and importantly is an MS-DOS compatible computer. The Portfolio is almost the exact same size as a VHS VCR tape. The Portfolio doesn’t really run MS-DOS, it runs DIP-DOS. It was designed by Distributed Information Processing (DIP) from Guildford, UK – this is their version of an MS-DOS 2.11 compatible operating system. This meant that writing/running fairly standard applications on a portfolio was a reality, giving it a edge on any other handheld of its day. There is no internal floppy or hard drive for data storage, all data is stored in the internal RAM memory. There is a slot on the left side for an optional memory card. In Terminator 2: Judgement Day the young John Conner uses a Portfolio to hack an ATM machine and to bypass the security at Cyberdyne Systems, so it must be good, right? In 1991 apple released the PowerBook 100 series of portable computers. At the bottom of the range was the 100, a Sony designed miniaturisation of the earlier Macintosh Portable. The 140 and 170 models were produced entirely by Apple and with the 25MHz Motorola 68030 CPU, 4 MB RAM, 80 MB Hard Drive and 640 X 480 Active Matrix screen, the 170 reflected cutting edge portable computing. The PowerBook was also the first machine to push the Keyboard back allowing for space to rest your palms whilst typing. This gave it what we now consider to be the archetypal “laptop” design, still seen today. As the first really useful portable Macintosh computers, the PowerBooks were a great success for Apple, selling over 100,000 in the first three months alone, and sales in excess of $1 billion in the first year. Interestingly the PowerBook 100 was the most compact Apple for the next 10 years until the Titanium PowerBook of 2001. Hopefully we will add to our collection over the years – We even have a wish list!